Cyslabdan was isolated from the culture broth of Streptomyces sp. K04-0144 as a new potentiator of imipenem activity against methicillin-resistant Staphylococcus aureus. We accomplished the synthesis of cyslabdan according to a previously reported structure. However, we subsequently found that this structure was incorrect; our analysis of natural cyslabdan showed that it possessed R stereochemistry at the C8 position, not S, as had previously been reported. 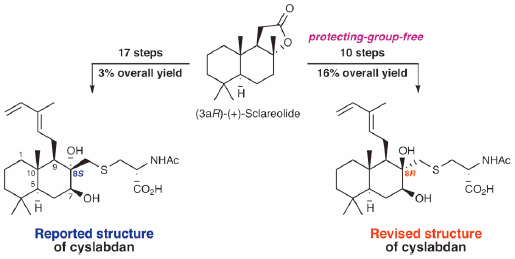 Thus, we completed the protecting-group-free synthesis of the correct structure of cyslabdan, which is described herein.